"In the first captivating instalment of his autobiography, Challis charts his childhood and the career path that saw him achieve overnight success after almost 25 years in show business." "Fun, flirty and affectionate. What a good read! 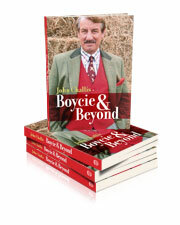 Proud to hold the record as Boycie's steadiest date, I can't wait for the follow up." "A must read for fans of Only Fools"
This is the Audio book version of part one of John Challis ' autobiography "Being Boycie" and is read by John himself. Choose two formats MP3 or iTunes using the buttons below.